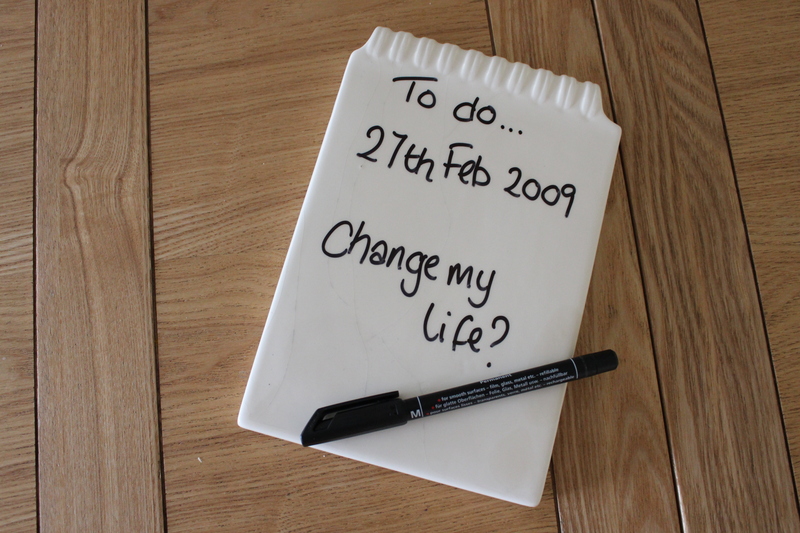 27 February 2009 was a day that changed my life. As uneventful as the day seemed, at the time, it was the start of a journey toward a different type of family life. A simpler family life. I won’t bore you with the detail as it’s likely you’ve heard it all before, but if it not – click here. Who’d have thought a short stroll, and buggy-push, to the local library could be the beginning of something so life-changing? Not I.
I grabbed 2 books off the shelf that day. The Courage To Grieve and Simplify Your Life. Naomi’s book on simplification was the epitome of ‘right time right place’. It was so relevant to what I needed to read at that time in my life. But the real life-changer was in the additional information at the back of the book. The web address for www.zenhabits.net. I’d never read a blog before. This was a completely new experience. Leo Babauta is probably the most famous blogger there is. Well, maybe after Belle de Jour. I’m sure I’m not sharing anything today that you don’t already know. Zen Habits can change your life, or at least open your eyes to what may be possible. So why this post? Today? Earlier I had another completely new experience. Brace yourself – as it may surprise you. Today I listened to a podcast for the first time on my iPhone. To pass the time whist doing chores (which I find immensely boring but necessary) I downloaded this from Good Life Project. Not knowing what to download I opted for a safe bet. There’d be a lesson from Leo in there somewhere. Lesson 1 – It doesn’t matter how much you read of one author, if they genuinely have something to share then you will always learn more. Lesson 2 – Listening to something rather than reading the words from a page is a different experience. Listening to Leo’s voice has brought his writing to life for me, This is something that recently I discovered, even more intensely, when meeting Rachel aka The Minimalist Mom for the first time in person, after knowing her virtually for almost 4 years. Lesson 3 – I really shouldn’t e-mail unsubscribe from blogs I love, purely to reduce inbox traffic. I’ve done this with a couple of the favourite blogs I read, thinking my habits of reading them were so inbred I would remember to check them daily. It hasn’t happened and some gems have been missed (see lesson 4). Lesson 4 – That discomfort is good. In checking out Leo’s blog today I found a recent post about discomfort. I needed to read this. My natural reaction, to discomfort, is to back off. Would it surprise you to learn that as much as I love blogging sometimes I am really uncomfortable with it? Do you ever have a dream where you are naked infront of a room full of people? It’s awkward and uncomfortable. That’s how I sometimes feel about blogging. But what I know deep down, and what Leo confirms, is that discomfort is good. Generally the more uncomfortable I feel writing a post (or running, or baking…), the better the finished article. Lesson 5 – Showing gratitude is very important. We all measure our success differently. Leo measures his by how many people he has helped, even if that number is just 1. This post is a thank you to Leo. Because he helped me on a Friday afternoon 4 years ago, and continues to do so. Lesson 6 – Lists are the way to go. I don’t aspire to be as minimal as Leo, but I still find his blog inspiring! Hey Clare! I listen to Graham Norton too (but in real-time). Have you ever seen his chat show? It airs here late Friday evening…I love it. But I love Graham Norton full-stop. To have the ability to honestly say what you think, but to not cause (well not always!) offence is a rare quality. (He hosted our Baftas on the BBC earlier this year… his comment to the audience about getting on with it before anyone else got arrested (highly paraphrased) literally made me gasp! but laugh! it was gold. Pure gold. But that’s my sense of humour I guess. I confuse Zen habits with mnlists or however it’s spelt! I’ve yet to try podcasts, but I really should. Such a technophobe! I also love having emailed blog posts, but there’s still some I check in regularly independent of emails (like yours) – I’m not sure why. The email influx can be insane some days!